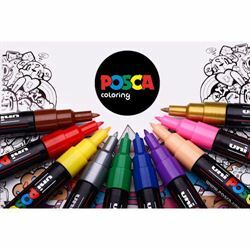 Non-toxic, water-based POSCA paint markers can be used on almost any surface, and are loved by professionals, creative hobbyists and amateurs alike. The alcohol and solvent-free opaque paint covers well, is blendable, dries quickly and can be overlaid when dry. ACMI certified and made in Japan. Available in 55 colors and eight tip sizes ranging from .7mm to 15mm for all types of art, craft, graffiti, decor and more. The PCF-350 brush tip marker combines the advantages of a paintbrush with the benefits of a pen. With its soft tip, it can be used for hard to reach areas, and it allows professionals, beginners and children to experience the pleasure of painting without the props. The PC-1MR ultra-fine tip marker has the same qualities as a paint marker in the form of a fine tip pen. It's designed for professionals and beginners requiring an ultra-fine and consistent line in a wide selection of colors. The PC-1M extra-fine, tapered bullet tip marker is ideal for fine detailed work. A favorite of both children and adults to color or write with accuracy. The PC-3M fine bullet tip marker is great for both coloring and writing clean lines. This versatile marker can be used to customize, create, decorate or mark anything that inspires you. The PC-5M medium bullet tip marker is the "multi-purpose" marker of the POSCA range. It produces neat and precise lines, and is ideal for coloring. An all-around favorite of both professionals and beginners. The PC-7M broad bullet tip marker is ideal for large-scale precision and drawing smooth, curved lines. This newest size is appreciated by both amateurs and professionals, as a natural complement to the PC-8K. The PC-8K broad chisel tip marker draws neat curves and covers large surfaces. Ideal for flat-tints, urban art, sign making, interior design, board customization and more. The PC-17K extra-broad, rectangular chisel tip marker is a favorite of professionals and artists for creating large-scale artwork. Great for filling in background colors, wall murals, urban art, interior design and more.